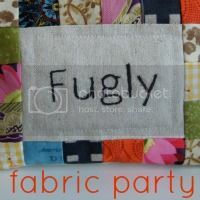 Lucy At Charm About You is hosting the Fugly Fabric Party. You know how rescue groups take unwanted pets and find new, loving homes for them? Yeah, it's basically like that, but for fabric! 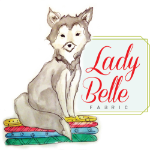 All of the unloved fabrics of the world deserve a new home where they can be used, right? So, I'm having a giveaway with my contributions to the Fugly Fabric Party! First up is a set of 24 fat quarters. They're all quilt shop quality fabrics. I ordered a grab bag set of a ton of FQ's one time, and actually used most of them, but these just aren't my style. To be fair, some of them aren't truly hideous, but they just don't quite fit with the kinds of quilts I make. Now, my second offering, I knowingly purchased. Perhaps you remember my brother in law's Outdoorsman's Quilt? Well, I purchased the camouflage fabric with my calculations for regular 44 inch fabric. Well, that fabric was 57 inch fabric, so I had a LOT of leftovers. It's licensed Mossy Oak camouflage, and was not cheap. I have three big pieces that I'm guessing total 2-3 yards. I just can't fathom another use for this fabric, since this quilt was so different from what I usually sew. 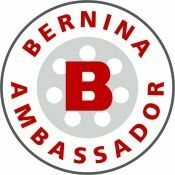 So, what do you need to do to win one of them? Easy! Just leave me a comment letting me know which one you would like. Next Saturday, on 8/31, I'll randomly choose numbers to pick the winners! Followers get a second chance to win. Just be sure to leave a second comment to let me know how you're following! Sadly, I can't ship outside of the US. I hope this neglected fabric can find a home where it will be used and loved! 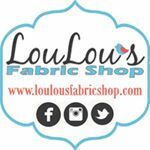 Check out Lucy's Fugly Fabric Party for other fabric rescues out there! 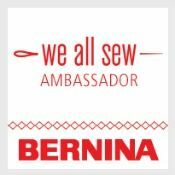 Welcome to Needle and Thread Thursday! For anybody that missed last weekend's post, I have now completely finished all four memory quilts made from my grandfather's shirts. You can read more about them HERE. Lately though, I've been plowing through my scraps as quickly as I can sewing scrappy improv blocks. And this evening, I got through all of them! Oh yes I did, y'all! I used every single bit of my scraps to make these 70, 12.5 inch improv blocks. That's enough for quite a large quilt, plus some blocks for the backing. Woo hoo! Okay, to be completely truthful, I did save some white strips that are wide enough to use in my quilt labels. But that's it! The rest of the scraps are in there. I hope I can get the top stitched up for a Friday finish! Check out these empty scrap baskets! They probably won't be this way for long! Now take a look at some of the fabulous projects that were linked to last week's Needle and Thread Thursday! 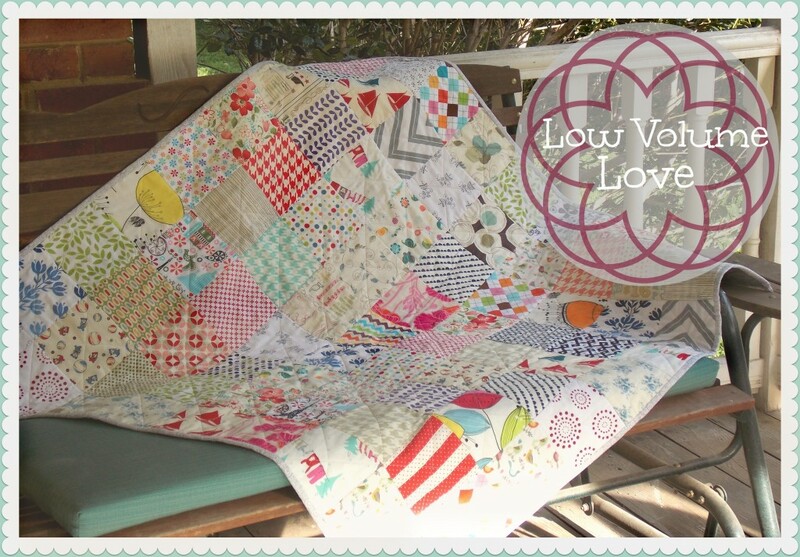 Miss Muffet Quilts shared this Simply HST quilt! Janet at Simply Pieced shared her progress on this stunning Arkansas Traveler quilt. and Kim at Windsor and Main shared her Low Volume Love quilt. I'm so excited to see what you're up to this week! For anyone that missed it last week, please grab my new NTT button. Since I've redesigned my blog, your old one won't work! 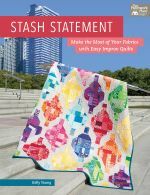 When I blogged about my scrappy improv blocks, I had several people mention that they were afraid to try it with their own scraps, since there really isn't a true plan for sewing. It does take some time to get used to sewing with reckless abandon in an improv style, but I thought that a few guidelines might help some of you take the plunge. Once you get the hang of it, this method of sewing is so much fun, and it's a great way to use whatever fabric you happen to have. The first thing you need to decide is how big you want your blocks to be. I use a 12.5 inch square ruler, and I find it makes things much easier. 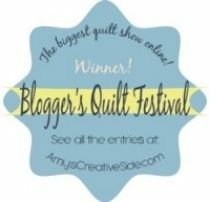 If you would rather use a regular quilting ruler, that's fine too! Get all of your fabric ready and divided in whatever way works for you. I have my scrap baskets divided into cool, warm, and neutrals. I also don't distinguish between scraps and strings. They all go in together, and you'll love using both with improv piecing. Start by sewing two pieces of fabric together. It's helpful if the sides you're sewing are similar in length, but not necessary. When you're finished sewing, just take your scissors and trim the excess. Add another piece to any side you choose. I always try not to sew around the first piece in a regular way, so that it doesn't end up looking too much like a log cabin block. If you don't come across a piece that is long enough to cover the side, or if you just want some variety, piece a couple of scraps together to make them long enough. As your sides get longer, you will have to piece smaller scraps to get enough length. Try to avoid sewing too many long strips on the sides or your block might end up looking like a log cabin instead of an improv block. I don't press my block until the end when I'm sewing like this, but you can if you choose. Continue adding to your sides until you have a block that is about 3-4 inches bigger than your square template. I know you're wondering why you are making blocks that are too big, but just trust me. The part that will make your blocks really special is coming up. Give your block a press and take it to your cutting mat. Line up your template along one edge of your block. Check our those extra side strips! Cut them off with care and don't throw them away. You'll need them later! 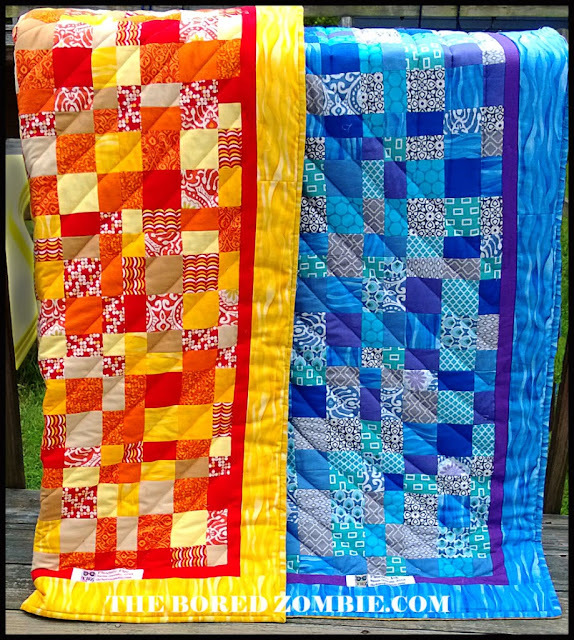 I know when I look at quilts that are improv pieced I'm always impressed by the tiny little strips and fabric bits that seem so perfectly placed within the blocks. Well, you can get those neat little pieces without actually sewing teeny tiny pieces. We're going to use those fabulous little trimmed strips in your next blocks! One or two of those strips can really add a lot of interest to a block full of bigger pieces. 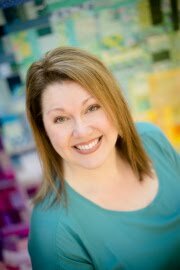 If you really get on a roll, you can always make a really big improv block and cut several blocks from it! This also gives you the freedom to use pieces that are a little bigger, because there is a good chance that they will get cut when you cut your blocks out. 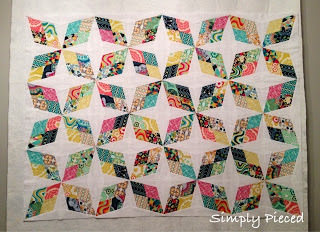 You can do improv piecing with a planned color palette as well! If you choose to use scraps though, just remember that the beauty of a scrap quilt isn't fully realized until all of the blocks are together. 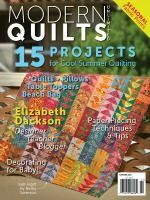 In my opinion, that's when scrap quilts really show their wow factor! I really encourage you to try some improv piecing. Once you get the hang of it, it's a lot of fun, and I think it's really great for getting your creativity and sewjo going! Editied 8/25 to add- Here's a picture of the finished quilt, just in case you're wondering how it looks when the blocks are all put together! 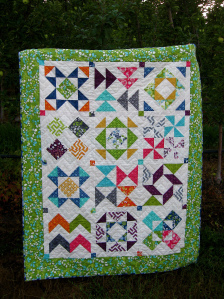 You can check out the post with more pics of the finished quilt HERE! Do y'all remember the shot of my scrap baskets I posted last week in my Full Stash Disclosure? I've been saving my scraps to someday be able to make a perfectly beautiful scrappy quilt. I love scrappy quilts, especially when they are filled with cherished bits and pieces of fabrics you love. Anyway, if you missed them last week, here's a picture of them, with scraps divided into warm, cool, and neutral baskets. Remember, this is the "before" shot. Divided into neat little baskets, I thought, "hmmm... these are totally manageable, and I probably have enough for a nice sized scrap quilt now." I can probably bust these scrap baskets in a few hours. Yeah. Riiight. Last night, I started sewing improv style (or slab style) and making 12.5 inch blocks. And I kept sewing...and sewing...and sewing. I've now finished up 32 blocks! I've really grown to love sewing this way, and it's such a natural way to use scraps! So, are you ready to see my scrap baskets after all of that sewing? Here they are! Yeah. Almost completely full. Still! I don't really know how that's possible (I'm convinced they're reproducing when my back is turned), but I'm coming to realize that I may have enough scraps in these baskets for a couple of quilts, or maybe one gigantic one with an awesomely pieced backing. Y'all know me- I'm a one project at a time kind of girl, so I'm just going to keep at it until these baskets are empty (or almost empty). I laid out four of the blocks so you can get a bit of an idea of how the quilt will look. 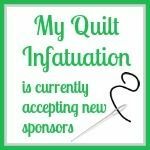 I really love the whole fabric explosion look, and I love that I can look at the fabrics and see little bits of the quilts I've made and loved, that have gone on to new homes.